> Israel had returned from its state of exile. > Things were not working out: land was in ruins; not everyone came back; famines occurred. > Tie-in to gold and frankincense. > Image of kings comes from these passages. I Paul, a prisoner for Christ Jesus for the sake of you Gentiles—assume that you have already heard of the commission of God’s grace that was given me for you, and how the mystery was made known to me by revelation, as I wrote above in a few words, a reading of which will enable you to perceive my understanding of the mystery of Christ. In former generations this mystery was not made known to humankind, as it has now been revealed to his holy apostles and prophets by the Spirit: that is, the Gentiles have become fellow heirs, members of the same body, and sharers in the promise in Christ Jesus through the gospel. Of this gospel I have become a servant according to the gift of God’s grace that was given me by the working of his power. Although I am the very least of all the saints, this grace was given to me to bring to the Gentiles the news of the boundless riches of Christ, and to make everyone see what is the plan of the mystery hidden for ages in God who created all things; so that through the church the wisdom of God in its rich variety might now be made known to the rulers and authorities in the heavenly places. This was in accordance with the eternal purpose that he has carried out in Christ Jesus our Lord, in whom we have access to God in boldness and confidence through faith in him. > God is coming for all people. 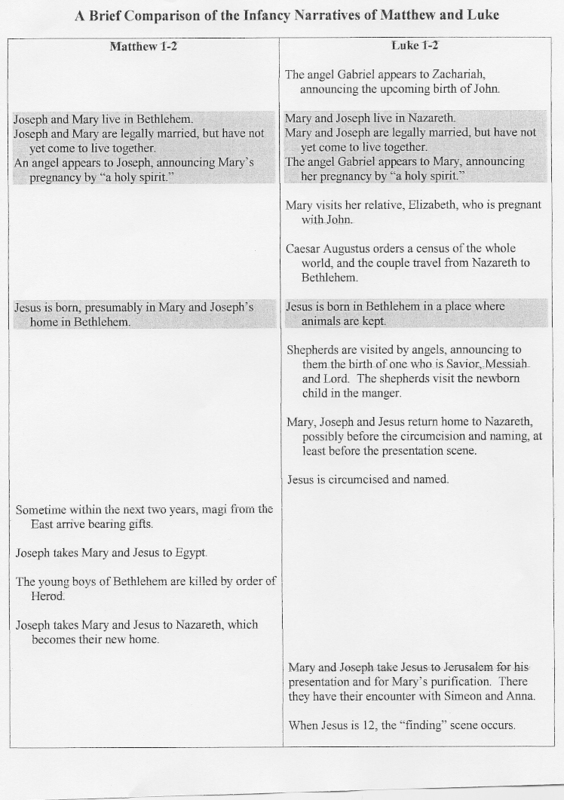 > Comparison of Matthew and Luke (see below).